I've been watching a lot of Jamie at home on youtube lately. It's just unbelievable how inspiring Jamie oliver recipes are. Whatever I start watching: chilies, strawberries, pizza, I just want to try and make everything. And ideally even get my own garden. Though the garden might be a bit too much for me already. The last thing I watched was Jamie's homemade tagliatelle with cheese sauce. I wanted to make them so badly, but I came back to earth very quickly. I haven't yet found a place in Moscow where one can buy the proper flour for pasta making. However the cheese sauce for this pasta was still driving me crazy so here I am making it (with ready made pasta from a supermarket). Whatever you do to make this dish is so colorful and feels so nice! I think I'd make this cheese sauce pasta again even if I knew I won't get to eat any of it. This time I got some of course. My mom and dad and little brother also did. So the size of my happiness doubled. Bring a large pan of water to boil. In a heatproof bowl combine the cheeses (set 50 gr of parmesan aside for serving) with sour cream, salt and pepper. Set the bowl on top of the pan and let the cheeses slowly melt together. When the sauce is even and oozy, take the bowl off the heat. Finely slice the stalks of broccoli diagonally and leave the florets whole (cutting any larger ones in half). Now cook the pasta. Add salt and a bit of olive oil into the boiling water and drop the pasta in. Fettucini needed 6 minutes, but follow the timing for the pasta of your choice. 3 minutes before the pasta is ready, drop the broccoli in. When the pasta is ready, drain it and keep some of the cooking water. To finish the sauce, whisk the egg yolk and thyme into the cheeses. If the sauce got a little thick, add a bit of cooking water to make it loose and silky. 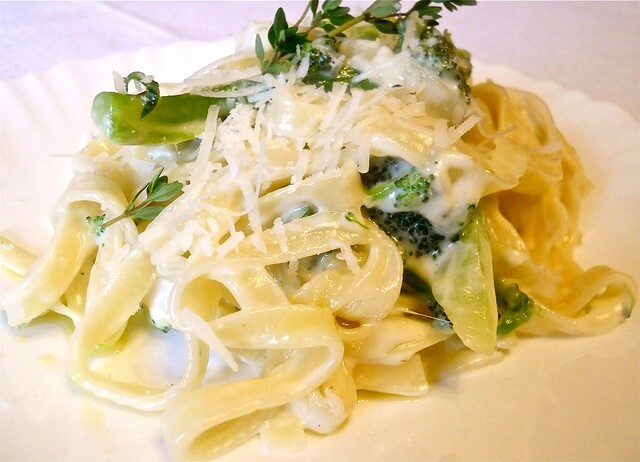 Pour the sauce over pasta with broccoli and toss well. Serve immediately with more parmesan and some fresh thyme leaves. Great recipe. Jamie's great isn't he? Jamie is amazing :-). One of the most beautiful people doing what they really love.